If I knew half the stuff I used to know about music when I was a DJ in college, I’d be one really cool 30-year-old. My tastes are somewhat stuck in the early 2000s, but those are where my first real memories of adventure and began. I used to write this travel blog with a song at the end of every post in the early days. These are all travel songs that mean something profound, whether they literally talk about skipping town or simply remind me of a favorite place to roam. Mexico, play it to me baby. This sibling duo has some of the craziest acoustic guitar skills I’ve ever heard. When I’m trying to make my ‘chilaquiles’ en la mañana I love to throw these guys on Pandora and rock out. getting the day started with some passionate, heart-beating-fast music is always going to get you going on the right foot. Their beats take me right back to Mexico, toes in the sand, mezcal sippers and street food galore. 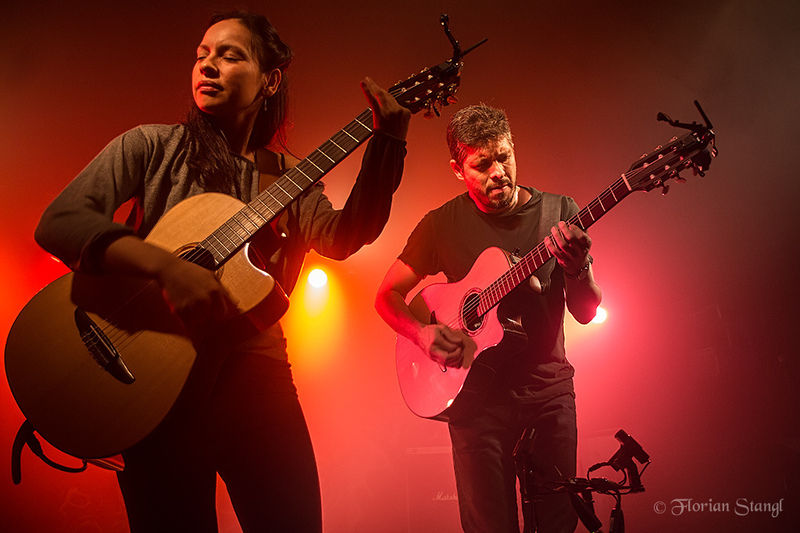 Watch some of their live performances too – I’ve never seen a more chill duo with fingers flying over the strings. Bluegrass? What? These guys came sneaky-sneaky-like into my playlist because they are mad talented. Hands down. Nickle Creek has been around since the 80s too but continue to put out fast and spirited albums. This is one of their newest singles and it’s one of the more literal ones on the list. It’s also a nice ‘go stuff yourself’ song for jilted lovers, which is always good to have on the back burner when you need a glass of wine and something other than Alanis Morissette after a breakup. I wanted this to be our wedding song, but it’s kind of about teenage pregnancy and skipping town. So maybe mildly inappropriate. It will stay my favorite road trip song though at least, as its infectious beat and makes me think of driving with the top down along the Pacific Coast Highway. The Killers are also my ideal festival band and bring through fond memories of dancing around in some field for the weekend – of course, after I’ve driven 12 hours to get there. Crank the volume, rev your engine and get going with this song. This song encourages you to pack up and get going. It’s another one about moving on thinly veiled under loving and letting go lyrics, but it can mean much more than that below the surface. Back in 2006 this was my jam and reminds me of sitting on a bench overlooking Spanish mountains with an old friend. It later was an anthem sung throughout my 20s (sung badly, it’s a tough one) to signify freedom. I miss the U.S. sometimes a lot. So when a born-and-bred American songwriter sings sweet music to my ears, I immediately think of the states fondly. While this Dylan song isn’t exactly about travel, it does resonate. Last weekend, I spent some time at the SONOS Studio in London to test out the new Play:5 speaker. It has some crazy technology, including Trueplay, which allows the speaker to correct its sound even if you do something silly like place it under your couch. For one of the demos, the team played ‘Man in the Long Black Coat’. Chirping crickets filled the room and it felt like night fell upon us. It reminded me of my trips down south to Mississippi and Arkansas, as stars would fill the sky and someone always strummed slowly on a guitar. Because this speaker can elevate music to an incredibly rich and all-encompassing level, I was transported to another time and place through this song. I’ve loved this song for a decade. If there was a song that inspired me to travel for the first time on my own, this would be it. From what I know, this band started because a 17-year-old Zach Condon dropped out of school and traveled Europe with his brother. Born in New Mexico, his sound is influenced by Mexican mariachi bands and World music for his travels. The nostalgic and longing message of ‘Postcards from Italy’ is what gets me. I haven’t even been to Italy yet, but this song is magic. With already a lot of meaning tied to simpler times in college and past crushes, songs by this Icelandic band have taken root in my heart. In fact I turned on this song to soundtrack my writing and got goosebumps all over again. They often only sing in their native language so you can truly focus on the sound. Sigur Rós often pokes fun at their own English-speaking audience and actually put out a full album in made up nonsense words – not many new the difference. I mentioned their documentary in my travel movie list too. When I head to Iceland in January, I plan to embrace the cliché and have these guys in the headphones the whole trip. I really hope I catch the northern lights while listening to Glósóli and have my life come full circle. This is totally gross. It’s a super weird song with rapping and that sleazeball Robin Thicke, with some woman in the background who sounds like she’s having a VERY good time in French. When I was briefly living in Spain though, this song was always in my head. It was 2010 and I was too far from the music scene to know what was good for me. But it has a great beat and motivated me to walk around in the sunshine when I had two seconds away from my au pair family. What’s the one song that instantly transports you back to your favorite destination? Runaways… such a good song. Totally. Thanks for stopping by Brian, hope things are good with you! Other songs don t name names, but in your mind, the place evoked by the tune is so exact you have no doubt what town, city, or country the singer is crooning about until you meet another traveler who pictures an entirely different place every time that song is played. In keeping with your “gross” selection … you can’t always choose what songs get in your head on your travels. My first trip to Cuba was when that annoying Spanish Las Ketchup song was a big hit. I still don’t like it, but whenever I hear it I think fondly of that trip.